This cupboard belongs to a group of court cupboards. They are essentially a series of tiered tables, in each of which is a drawer. The decoration borrows from classical and late Renaissance ornament, which spread to England through French, German and Flemish engravings. Court cupboards were placed in the hall or dining parlour in the late 16th and early 17th centuries. They often housed eating and drinking vessels. Although they were connected with eating, some were placed in bedrooms where they provided shelf space for other domestic equipment. The name 'court cupboard' derives from court, the French word for 'short', perhaps meaning that the cupboard was short in stature. Brigadier William Ellis Clark gave the V&A more than 80 pieces of furniture between 1946 and 1968. He lived at Elmstead Place, Chislehurst, Kent, and collected all periods of English furniture. It was displayed according to dates and timbers - oak and walnut in a large oak-panelled room, mahogany in the dining room. Constructed of two tiers, supported by Ionic columns at the front and rectangular uprights at the back, the fronts of the latter fluted with intervening panels of diced ornament. Diamond ornaments are placed immediately above the capitals of the upper columns and below the base of the lower columns. The base is covered with strapwork and medallions, containing flowers,alternating with diamond ornaments. From dept file: 'The upper stage contains a frieze-drawer, the front carved with low relief strapwork and applied diamond ornaments. 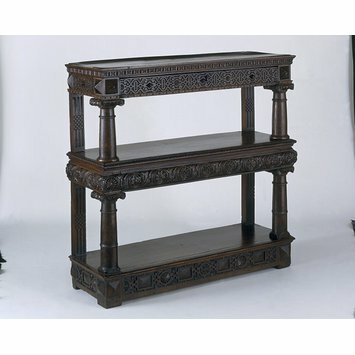 The lower stage also contains a drawer with convex front carved with guilloche ornament. The Ionic columns which act as supports are unusually plain compared to the bulbous columns and carved animals more generally used'. 'A cupboard was originally a shelved structure for the display of plate, rather than for storage'. A cupboard, as its name implies, was originally a shelved structure for the display of silver and other pieces, rather than a closed piece of furniture for storage. It would have been covered with cloths of decorative textile and linen damask, similar to these reproduction cloths. The lower one is of dornix, a cloth of linen, wool and sometimes (as here) gold thread. 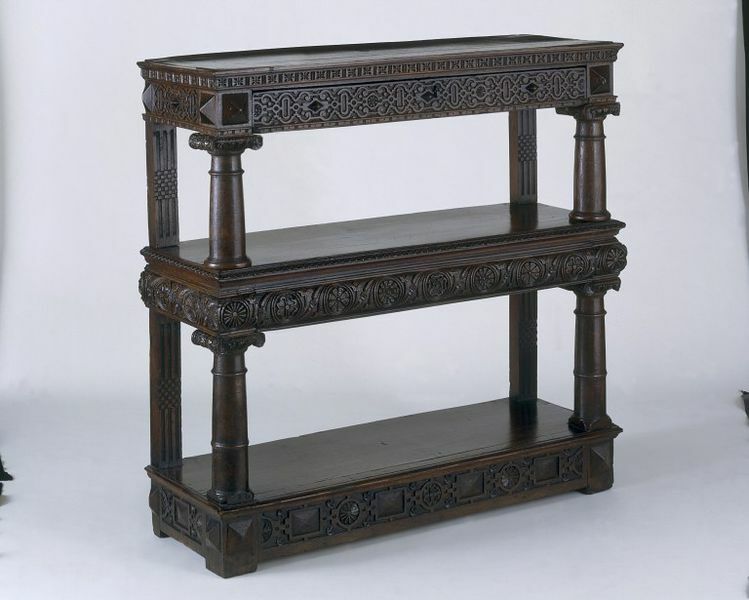 Historical significance: The court cupboard originally served as a series of tiered tables, on which the owner of the household displayed his plate. By the mid to late 16th century, shelves were introduced to the tiers, thus enabling storage. The decoration of this court cupboard borrows from classical and mannerist ornament, which spread to England through French, German and Flemish engravings. Through the National Art-Collections Fund. W.20 - 1958 gift of Brigadier W.E.Clark CMG DSO, through the National Art Collections Funds.